In order to resolve the serious humanitarian crisis in Myanmar, the leadership of State Counselor Aung San Suu Kyi, the country’s de facto head of government, is indispensable. South Africa will reverse its position and vote next month in the UN General Assembly for a resolution strongly condemning human rights abuses – including alleged genocide – by the Myanmar military against the Muslim minority Rohingya people. Foreign investment reached to over US$6,119 million in 2017-18 FY and more than US$2,100 million of them are invested in industrial sector, according a financial report of Myanmar Investment Commission (MIC) for 2017-18 FY. Myanmar earned more than US$70 million on export of more than 160,000 tons of marine products within one month of the 2018-2019 financial year, said a source of the Ministry of Commerce. There is both good news and bad news for Myanmar on the drug front: a sharp decline in opium cultivation and a shift toward synthetic drugs, especially methamphetamine. The leaders of Rohingya refugee camps in the Ukhia region of Cox’s Bazar District in Bangladesh called a three-day work strike on Monday to pressure the UN’s refugee agency to include “Rohingya” on the ID cards it has been issuing them. Over 15,000 people held a pro-military rally in Lashio of Shan State (North) on November 25, showing their support for the military’s stance on building a federalism-based union where all nationalities live in unity without secession. About 25 Myanmar football fans including women were attacked by around 30 Malaysians after a football match between Malaysia and Myanmar on November 24 evening near Kuala Lumpur, according to Hnalone Hla blood Donation group (Malaysia, Myanmar). Myanmar State Counselor Aung San Suu Kyi will pay an official visit to Nepal soon and attend the Asia-Pacific Summit-2018 to be held in Kathmandu, the Foreign Ministry said on Monday. The National Coalition Government of the Union of Burma (NCGUB) was made up of exiled pro-democracy leaders who were elected to the national parliament in 1990 (which was subsequently annulled) in one of the military junta’s very brief flirtations with democracy. I worked with them – largely remotely – between 2007 and 2009. The underdeveloped infrastructure of Chin State, Myanmar’s poorest province in terms of per capita income, could turn into enormous opportunities for local and foreign investors if they are well-prepared, according to a report. U Soe Thein, Vice President of Central Bank of Myanmar, said the Central Bank will not set interest rates for foreign banks’foreign currency loans, but instead the banks can set at the rate themselves. Myanmar is losing potential tax revenue from mining, Daw Moe Myoe Tun, Member of Myanmar Extractive Industries Transparency Initiative (MEITI), said at the event of launching EITI reports for 2014-15 and 2015-16. The government will hold another peace conference next month or in early 2019 to keep up with the original plan to hold two rounds of talks every year, U Zaw Htay, spokesperson for the President’s Office, said. Myanmar’s last royal capital, Mandalay, was recently ranked by CIO Asia as number fifth among the top 10 cities in Southeast Asia in the process of becoming “smart cities”. Local investors put in Ks17.856 trillion worth of investment including about US$10 billion within 30-year time starting from 1988-89 FY and over 23 per cent of them are made in housing development sector, according to Directorate of Investment and Companies Administration (DICA). Our NLD government taking office is not aimed at sending people to prisons as well as grabbing farmlands from people, said Nan Khin Htwe Myint, Chief Minister of Kayin State. The Heads of Mission of the European Union Delegation and EU Member States accredited to Myanmar issued the following statement on International Day for the Elimination of Violence against Women, which marks the start of the global 16 Days of Activism Against Gender-Based Violence. Chinese authorities are closely inspecting lorries coming into the country from Burma. Various items of packaged foods are entering Myanmar through illegal routes, and the government has much difficulty solving the problem, said Union Minister for Health and Sports Dr Myint Htwe. Control over avenues of social mobility has ensured Tatmadaw dominance, but greater freedoms in society and exposure to the world means its privileged position might not last in the long run. Three civilians have died and two others were injured during a clash between the Shan State Army-North and the Shan State Army-South in a village in Shan State’s Hsipaw Township on Friday morning, according to a civil society organization helping the victims. The Myanmar Army in Kutkai Township, northern Shan State, has released six Ta’ang locals which they arrested this week, while four others remain in detention. Some leaders of political parties have criticized the Union Election Commission (UEC) for allegedly interfering in the internal affairs of some parties. Firebrand monk U Wirathu accused the government of stalling permission for a private high school in Mandalay Region’s Patheingyi Township because avowed nationalists were behind the project. This week U Ko Ko Gyi — chairman of the People’s Party … has joined me to discuss his insights into Myanmar’s complicated political landscape. A total of 93 companies put in US$1.52 billion worth of investments from November 25 2014 to March 31 2018 in Thilawa Special Economic Zone (SEZ), according a financial report of Myanmar Investment Commission (MIC) for 2017-18 FY. Finding and retaining talent is one of the major challenges for companies in Myanmar: 75 percent of mid-sized and large companies consider it a key issue, according to a new Roland Berger HR study. With Asia Pacific now seen as an important region in the global economic landscape, Singapore International Foundation (SIF) has set its heart on strengthening regional integration. Singapore-based seed investor Cocoon Capital is launching its second $20-million fund targeting seed stage funding in enterprise tech startups in Southeast Asia, particularly in the deep tech, fintech and medtech niches. PTT Exploration and Production Public Company Limited (PTTEP) reported net profit in the third quarter of this year at $315 million, increasing by more than 100% compared to the same period last year. Thailand’s PTT Exploration and Production (PTTEP), a subsidiary of Thailand’s national oil and gas conglomerate PTT, has operations in ten countries including: Algeria, Australia, Brazil, Canada, Indonesia, Malaysia, Mexico, Mozambique, Myanmar, and Vietnam. Myanmar and India will finalize and sign a contract for government-to-government pulse trading this fiscal year. State-owned MPT, the largest mobile operator in Myanmar, announced it expanded LTE-Advanced service to 40 additional townships, taking its mobile broadband coverage to 256 townships. The refugee crisis on the Myanmar-Bangadesh border is a huge money-making business for international nongovernmental organisations (INGOs) that are providing assistance to over 700,000 Muslims who fled violence in northern Rakhine State last year, U Zaw Htay, spokesperson of the President’s Office, said. The Myanmar government’s spokesperson U Zaw Htay has accused international non-governmental organizations (INGOs) of deliberately discouraging refugees in Bangladesh from returning to Myanmar due to their own business interests. Bago Regional Government has announced that they will build a wholesale market on 15.13 acres of land in Kali (Tetkalay) village, in Bago Region. iMyanmarhouse.com organized a real estate expo for the Real Home Residence Condominium, located near Nawaday Junction in North Okkalarpa Township, on November 17 and 18, the expo generated over K1.7 billion in sales. After enacting the Traffic Safety and Vehicles Management Law, the government will handover vehicle inspection centers to private investors. An inclusive city should consider the convenience and comfort of all its residents, rich and poor alike, young and old; the health and the weak, said Joyce Chou, a founding member of Mircrosoft’s Inclusive Design Team. It is the train to nowhere that lets you see almost everything. Where other cities have open-top buses or river boats that show tourists the heart of the place, Yangon has a rickety old train which runs in a loop. There are few Western writers who have managed to nail down the important components of China’s ambitious “Belt Road Initiative”. Andre Wheeler is one of them. Opening-up has played a key role in the economic development of Tengchong, Yunnan province, both in the past and today, local authorities say. In a small and musty liquor store in downtown Yangon, a stock boy reaches behind rows of cheap Myanmar-made whisky and grabs a bottle of Jack Daniels. Experts, health advocates and stakeholders gathered recently to observe World Toilet Day, earlier this month to take a stock on toilets in restaurants and food stalls in the country, especially in Yangon. Two bridges will be built for locals using Ks 700 million near Thaphan Seik dam in Kyun Hla Township according to Kyun Hla Township Constituency (1) MP Kyaw Lin. THE Union Government has provided Ks18.6 million to Kayin State as assistance to help provide portable water to rural areas in the state, which is located southeast of Yangon. Five villages known for glaze pot making in Kyaukmyaung Township, Shwebo District, Sagaing Region, have formed a committee to help develop community-based tourism (CBT), said Soe Soe from the region CBT development board. Authorities have fined eight shops for using banned dyes in their products at Zaychodaw market in Mandalay city, which was declared a dye-free market in July, the regional Food and Drug Administration (FDA) Office said. The repainting of Sagaing’s Kaunghmudaw Pagoda will begin on Dec. 1, the pagoda’s trustee committee said on Sunday. The Southeast Asia Tobacco Control Alliance has honoured Pindaya Caves in Shan State with an award for promoting a healthy environment and preserving the uniqueness of its culture by being a smoke-free heritage site. HE 5th Film Analysis, an aspect of the Cinematheque Program, was held at the Film Development Centre under the Ministry of Information in Yangon yesterday. The new unique and unusual thing about a cute glass filled with soft drink is the bamboo straw sitting inside, radiating environmental friendliness and casting the former plastic straw into the bin of history. In the country’s economic capital of Yangon, there is this particular strip in downtown area which holds an annual celebration to honour cartoonists and comic book writers that have puts smiles on the faces of both the young and the old. Myanmar national team failed to reach the last four in the AFF Suzuki Cup after losing Malaysia 3-0 on Saturday at Bukit Jalil stadium in Kuala Lumpur. The Asian Football Confederation (AFC) announced the draws of the group stage of AFC Cup 2019 and Yangon United FC or Zwekapin United FC will host Home United from Singapore. Shan United FC will play away match with a Philippines club. Myanmar hosted the annual general meeting of the International Billiards and Snooker Federation (IBSF) in Yangon yesterday. This week’s Myanmar morning news feature photo acknowledges International Day for the Abolition of Slavery, December 2. 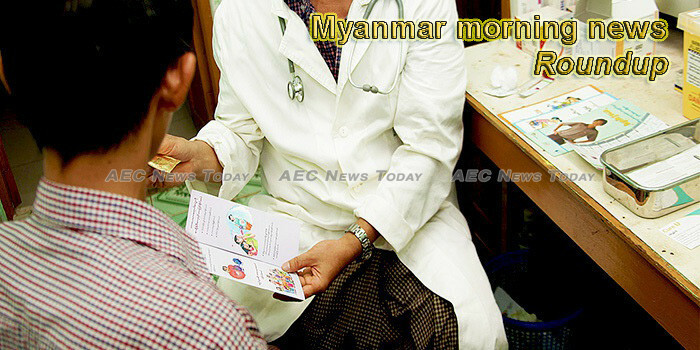 Myanmar morning news by AEC News Today is your one stop source for Myanmar news on matters of governance and policies affecting Asean business communities. It is published M-F by AEC News Today: Governance, not government; policies not politics. With a decade of experience as an editor and journalist, Roy has edited mastheads across Australia and Southeast Asia, from the remote island communities of the Torres Strait to Cambodia’s only award-winning newspaper, The Phnom Penh Post. A a professional photographer since the days of film, he holds a Bachelor of Arts in Photomedia and a Postgraduate Diploma in Journalism.